When I purchased the railroad property behind my house last year one of the major problems I encountered was the high property tax assessment. The property was assessed at $7,600 which is half the projected market value of the property. 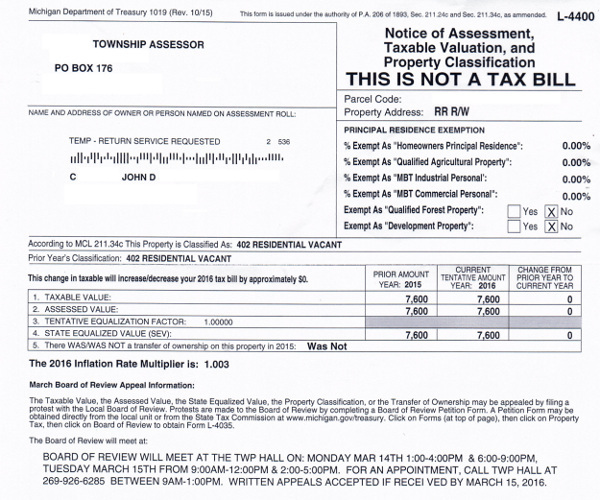 Since the township believes the property to be worth $15,200 and I paid $3,500 for it, I decided to appeal the property tax assessment. I was worried that I wouldn’t win because after all, I’m going up against the government and these disputes are not easily won. In general local governments don’t want to lower property tax assessments. Thankfully, last month I achieved victory, here’s what I did to win a property tax appeal. The vast majority of cities and townships that levy property taxes will only hear appeals once a year. This is the hallmark proof that they don’t want to lower assessments, giving you only 2 days out of the year when you can actually appeal their decisions. In January we receive a statement showing what our current property tax assessments are and at the bottom of this statement is the information for appealing the assessed value. In my township the board of review meets for 2 days in March and you can either show up in person or mail in an appeal. Because of my work schedule at the time I was not able to attend either day the board of review met, so I submitted my appeal by mail. I would highly suggest showing up in person if it is at all possible. Although I won my property tax assessment appeal by sending my appeal in the mail, I think it would have been more likely to succeed if I had been there to defend my position and answer any questions. The property tax appeal form is 1 page and takes under 10 minutes to fill out. This is a standardized form for all property owners in the state of Michigan, Form L-4035. With the form I also provided additional documents to support my claim. I included a copy of the deed showing what I paid for the property, I included a plat map showing the configuration of the property, which is a major reason for reducing its assessment, and I included a letter expanding on why I was appealing the assessment, since the form only provided a very small box, with room to write only 1 or 2 sentences. I researched the previous years assessments on the property and found that in 2009 the assessment jumped from $1,200 to $7,600 without any improvements taking place. All in all I spent about 30 minutes on this effort, including the time to drop the property tax appeal off at the post office. The more details and comparisons you have available the better. 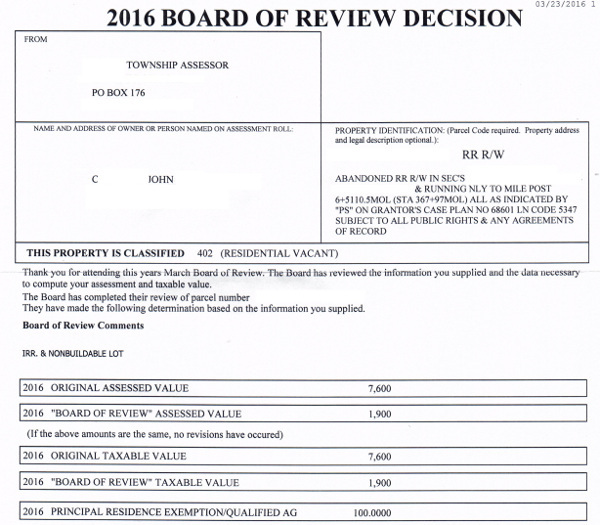 About 2 weeks after filing the property tax appeal I received the board of review decision in the mail. Not only did they reduce the assessment from $7,600 to $1,900, they also put in my principal residence exemption, because the property is adjacent to my principal residence. I didn’t even have to submit a principal residence exemption form! On a yearly basis before taking action, I was paying $305 per year in property taxes for this parcel. With the reassessed value this was reduced to $76, and thanks to the principal residence exemption it was reduced even further to $42 per year! This amounts to a yearly savings of $263, a reduction of 86%. I plan on living in this house for the rest of my life, which could be another 60 years. 60 years X $263 is $15,760. As an ROI for the time it took to appeal my property taxes, I earned $526 per hour if we include only this years benefit. If we include all future years, then I earned $31,530 per hour. This gives me some extra motivation to buy the adjacent chunk of railroad property that has been offered to me. Since I know I can successfully negotiate my property taxes down, in total I will be paying under $100 per year for all of the parcels combined, instead of the $600+ per year that it originally looked like I would be paying based on these extremely high assessments. What Can You Save By Filing A Property Tax Appeal? I saved $268 per year by having the assessment on a chunk of land reduced by roughly $12,000 in value. Think about this when you look at the values they are putting on your homes. If I were challenging the valuation on my home I would include a current appraisal. Most residential appraisals cost around $300. Think about the ROI on this, if you can get your home value reduced on paper by 12,000 in value the first year alone would pay for the appraisal and by the 2nd year you would have close to a 100% ROI! If it looks like there is a chance your property is over appraised by even $5,000 I would highly consider filing a property tax appeal. It isn’t all that uncommon for property assessments to be even 20% off of the true market value of the property. If you have a house that is truly worth $200,000 and they have it assessed at $240,000 this could be costing you an easy $1,000 a year, every single year. I live in a relatively low property tax area, in higher property tax areas winning a property tax appeal will make an even greater difference. What Can You Do To Win A Property Tax Appeal? 1. Familiarize yourself with the appeal process in your state. For Michigan Filers, look at form L-4035. 2. Keep all assessment records and compare to your purchase price and comparable properties that have recently sold. Some counties even have online programs where you can see the assessments on not only your property, but on all the properties in the county as well. My county, Berrien County, in Michigan has just such a program. For a $50 monthly fee, or a $15 single day fee, you can see all of this data, as well as the previous 3 years of property tax assessments. 3. Be ready to file an appeal during the few days per year the local board of appeals meets per year. Gather as much documentation as possible to support your claim. Chances are you will only get 1 shot per year to file a property tax appeal, so it is in your best interest to be ready well in advance. 4. Work outside the system: If the board of appeals doesn’t meet for several months, try writing a letter to the local assessor. I did this with a house I owned in Benton Harbor, MI and the assessor came out personally and lowered the assessment from $47,000 to $15,000 for me outside of the appeals process, saving me over $1,000 a year. Have you ever filed a property tax appeal? What was the experience like for you? 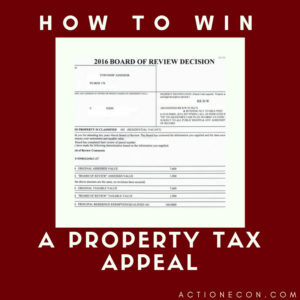 For more on the process, check out the book Appeal Your Property Taxes – And Win. 5 Responses to "How To Win A Property Tax Appeal"
Great work! Big savings which will continue on as long as you’re there! I had always received 3 separate tax bill and had repeatedly requested they be combined into a single bill and was told that the computer couldn’t do that. It was no problem until two of the parcels tripled their assessment. I went down and asked for the appeal paperwork. The clerk argued with me for 15 minutes saying I might want to turn that property into a subdivision and it just wasn’t possible to combine everything under my homestead. I must have asked for the appeal paperwork 15 times before she finally referred me to someone else. I filled out all the paperwork mailed it in and waited for a response. Everything was approved, the assessment was lowered by over $30,000 and miraculously that computer was suddenly able to provide me with a single tax bill and all my property fell under the homestead exemption. Wow, what a headache! That’s crazy how much they increased the assessment by. That’s one great thing about living in Michigan, even if they increase the assessment way out of line,they can only increase the taxes you pay by 5% or the rate of inflation, whichever is lower. Thanks for covering this–I’ve never read an article on the topic. That’s great it is saving you almost $50 a month. This is great information and well communicated. Knowing how to appeal an inaccurate assessment is the homeowner’s responsibility. Not doing so can have significant consequences from overpaying taxes to foreclosure. This happened annually to Detroit homeowners in 2008 and beyond.